A Plastic Worm Gear for various Motion transfer mechanism designs. It fits tightly on any 6mm D Shape Shaft motor, for example commonly available BO motors and D Shaped High Torque DC motors. This gear comes with a reducer nut to couple axle/ shafts of diameter less than the actual diameter. The PCF8574 is a silicon CMOS circuit. It provides general purpose remote I/O expansion for most mic.. 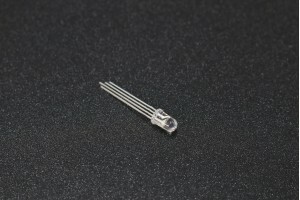 The ADXL337 is a small, thin, low power, a complete 3-axis accelerometer with signal conditioned ana.. Specifications Wire Type: 4 Pin .. Measuring the absolute pressure of the environment using a digital barometer such as this has some ..
LEDs- A must have for power indication, pin status, opto-electronic sensors, and fun blinky displa..
2Way UART communication selector switch is used for two UART communications to interface the micro..